In terms of humane meal prep, cooking lobsters alive hovers safely in questionable territory. 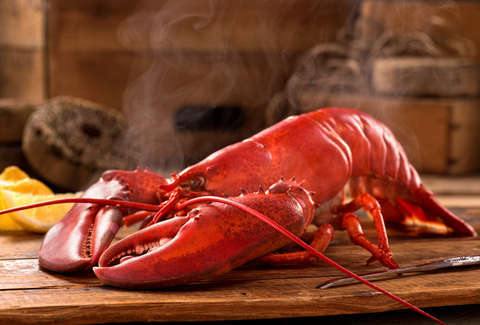 The verdict is still out on whether the creatures can actually feel pain when they're being steamed or boiled, but one restaurant owner in Maine is hoping to quell any queasy sense of guilt diners may have by getting its clawed crustaceans seriously stoned before it cooks them, so as to ensure they're at least high out of their minds when they die. This is our crazy world in 2018, what else would you expect? At Charlotte's Legendary Lobster Pound in Southwest Harbor, Maine, when you order a lobster from the menu, you can opt to ensure the creature you're about to consume dies while at least semi-sedated. That's because its owner, Charlotte Gill, has implemented a new innovative preparation method that involves infusing the lobster's tank with marijuana smoke to chill them out. That's right, if you so choose, you can opt to have your lobster hot-boxed before it goes to the big ol' ocean in the sky. "I feel bad that when lobsters come here there is no exit strategy,” Gill said in an interview with the Mount Desert Islander. “It’s a unique place and you get to do such unique things but at the expense of this little creature. I’ve really been trying to figure out how to make it better.” Her concerns aren't unique, either. Earlier this year, Switzerland took the bold step of banning the practice of boiling lobster alive, requiring that they be "stunned" before killed. Gill, a long-time animal rights advocate, first tested out the new practice on a single lobster named Roscoe. She placed him in a box with water on the bottom, and blew some weed smoke in there. He seemed so chilled out that she took the bands off his claws and let him back in the tank with the others, where he remained seemingly relaxed for a few weeks, never attempting to use his claws to fight. That, she figured, was enough evidence to suggest that getting the lil' guys a bit high could put them in a better frame of mind as they face their fate. She's now devising a larger tank to hold multiple lobsters at a time while an air mattress pump infuses the water with the smoke, according to the Mount Desert Islander. While Gill's methods are certainly unconventional, she's doing it all legally, since she holds a medical marijuana caregiver license in the state of Maine, and is growing the weed herself. And if you're concerned (or excited) that a THC-infused lobster might get you high when you eat it, there's no reason to be. That's because THC breaks down at a certain temperature, and Gill has taken precautions to ensure the lobsters are exposed to enough heat to eliminate the possibility that you'll end up a bit sedated yourself. "I'm not selling an edible," she told the MDI. Then again, there are probably plenty of people who wish she were.